Standing in front of a large audience and performing can be daunting, but not for some local students who competed in the Oxley Group CWA Public Speaking Competition recently. Four students from St Joseph’s Parish School, four students from Condobolin Public School and two from Condobolin High School delivered their speeches to the judges. 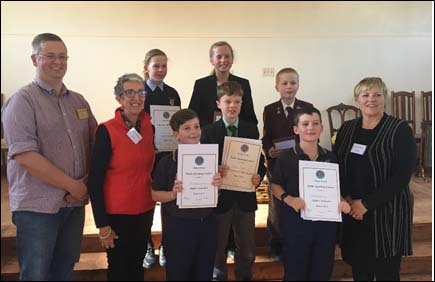 Mikaela, Nicholas and William Cooney from Condobolin Public and Maya Doyle from St Joseph’s Parish School, have been selected to compete in the Inter Group Competition in Molong, on Tuesday, 19 June. Condobolin High School’s Corey Herbert also advanced in the Secondary section. Only eight were selected from 57 students from across the local area for this honour. Those chosen will compete against Central Western and Far Western CWA Groups. Hunter Collins (Condobolin Public School) Kiara Harris (Condobolin High School), along with Cameron Stuckey, Hunter Laing, and Halle Doyle (St Joseph’s Parish School) also took part. Secondary students went first, detailing their views on the importance of speaking up, personal space, education needing to be creative and whether we can be replaced by robots. The Primary students expressed their thoughts on finding notes under their pillows, the life of a ladybird, junk food, blame and what they envisaged 25 years from now. Adjudicators on the day were Suellen Taylor, Sharon Phipps, Michael Jelbart, Lesley Jelbart, Christine Somers and Craig Armstrong.